With a placid American force staying in or close to Fort George, the emboldened British conducted some raids on American supply depots on the American side of the Niagara River. The first was at Fort Schlosser on July 5th (just above Niagara Falls). A number of men from the 41st Regiment took part in the raid. One of whom, Captain William Caulfield Saunders⁵ was wounded and captured. Direct descendants of Captain Saunders have come forward with papers attributed to Captain Saunders’ experiences at Black Rock. They also are in possession of some artifacts related to his Black Rock experiences; a pocket tourniquet and uniform fragments which apparently exhibit the entry and exit holes of the ball that struck him. In their words, the original document was transcribed by someone who struggled with deciphering the hand-writing. Even in a rough form, it still exhibits some fascinating insights into some very personal experiences related to this War of 1812 action. Interestingly, the family points out that in his personal life, Saunders chose to go by the name “Henry Caulfield Saunders” rather than the William Caulfield Saunders found throughout his military records. Henry was also the name of Saunders’ father. On the 11th July 1813 in an action with the Americans aided by Indians, I received a rifle shot in the left side of the chest, which passed out through the right shoulder blade from which a large stream of blood flowed, when hit, it appeared and struck me at the moment as if a Harlequin had struck with his wand; no other sensation ……. turned round and walked down a slope to the river to get on board a Batteaux, then shoving off went up to my neck in water without the boat being able to reach me, being then aground under a destructive fire from the high bank. Knowing the Indian who shot me was in pursuit – I observed him stabbing a soldier of mine (as I afterwards examined in the arms and thighs the poor fellow was down and badly wounded) I then called to the men in the Batteaux to fire a volley on me to dispatch me at once and pointed to the cunning savage with my sword arm elevated, in that state it was struck by a musket ball and sword dashed out of my grasp the end dangling only by a few sinews fell on left side and injured a rib by falling on the stump of a tree or flour barrel – the Indian dash up took off my hat first and could feel his hands on my hair with his scalping knife bloody between his teeth he then twisted me about and I was in great torture –when he espied the plated ornaments on my waist-belt and sash, this employed him for a short time as others of his tribe coming up would have probably interfered in possessing his spoil, at which to me critical moment a few American Officers of influence rescued me from the Indians – and hardly able to breath I retained my presence of mind notwithstanding for a short time – but found my sight dimmed and strength going rapidly when it struck me that a pocket tourniquet which I fortunately had in my pocket if applied to the artery of right arm would restore me – I had great difficulty in making the American sensible what I wanted, or where my pocket was, it being a side one in the skirt on getting the tourniquet showed them where to buckle it above the right arm – I found my sight restored but felt great pain below the elbow – in that state was humanely borne up to the residence of an American General in a blanket, the surgeon attended, cut off my clothes, bound up my wrist but did not stop the flow of blood from the orifice made in the chest: don’t know whether or not I bled from that, or the shoulder bone – the surgeon declared my case hopeless and that I had but six hours to live – they called again in the evening and told me that a handsome coffin was made, and due honours awaited me as several men and women spoke of my making them keep their houses and need not fear being molested, I told them to give the coffin to some of my men as I felt assured of not then requiring it they did so for two days after continued delirious – the wound in chest from unremitting care and attention closed in about three weeks, the wrist proved very obstinate and continued open for two years – bones constantly exfoliating – then would close for several months, and bone again appear. The tourniquet was given me by Asst. Surgeon Moore and shown by him how to apply it, was very near parting with it two days before to fix on the arm of an Indian boy twelve or fourteen years old whose hand was blown off by a six pound shot, he was heroically brandishing the bleeding stump, and giving the war whoop to his tribe of Warriors and Squaws, and cured by them in a shorter time than if in our hospitals. I tried for some time to fix the tourniquet but could not succeed, such was the ardour of the youth, and contempt of bodily suffering in which the North American Warriors excel, it is almost beyond belief. It appears extraordinary, but was witnessed by pensioners now in Chelsea, I can only account for it in this manner. The Indians when hunting assert that an animal, struck by a rifle will run several hundred yards before the drop. On the contrary, with a ball from a smooth bore will drop instantly. An image of the artifacts associated with Captain Saunders, held by the Stone Family. 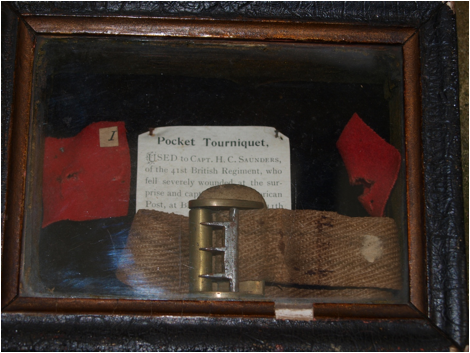 The placard reads, “Pocket Tourniquet USED to Capt. H.C. Saunders, of the 41st British Regiment, who fell severely wounded at the surprise and capture of the American Post, at Black Rock, on the 11th July, 1813”. ² Cecil Bisshopp: ensign 1st Foot Guards 20 March 1799, lieutenant 1st Foot Guards 16 October 1800, half pay 25 August 1802, lieutenant 1st Foot Guards 3 September 1803, brevet major 1 November 1811, brevet lieutenant-colonel/inspecting field officer of militia in British North America 23 April 1812, died of wounds 15 or 16 July 1813 at Stamford, Upper Canada. ⁵ From Stuart Sutherland’s His Majesty’s Gentlemen, William Caulfield Saunders: ensign 41st Foot 24 March 1796, lieutenant 30th Foot 1 June 1797, lieutenant 41st Foot 1 November 1797, captain 41st Foot 16 May 1811, retired 10 January 1822. ⁶ Use of this document and the supporting image is with the consent of the Stone family. It is not to be copied or reproduced without their authorization.